Garcia and his male friend were struck by gunfire. Garcia was pronounced dead at the scene at 12:07 a.m. with multiple gunshot wounds, according to coroner’s records. His friend was taken to the hospital in critical condition “but miraculously survived his injuries,” Mendoza said. The suspect was described as a light-skinned Latino, about 6 feet tall and medium build, with brown eyes, black short hair, a goatee and a black baseball-type cap with an unknown logo. He was last seen running south into the alley. Garcia grew up in Monrovia, a small city east of Pasadena. He played soccer at Canyon Oaks High School and loved to skateboard. After graduation in June, he planned to attend Pasadena City College and study photography. During the news conference, Garcia’s mother, Guadalupe Castañeda, stood quietly beside Mendoza as he laid out the details of the shooting and then took the microphone herself, her eyes closed, speaking through tears as she asked the public to identify the man who killed her son. Friends are collecting funds online to help Garcia's family. Anyone with information is asked to call the sheriff’s Homicide Bureau and ask for Sgt. Ken Perry or Det. Scott Matlock, at (323) 890-5500. Those wishing to remain anonymous should call Crime Stoppers at (800) 222-8477. 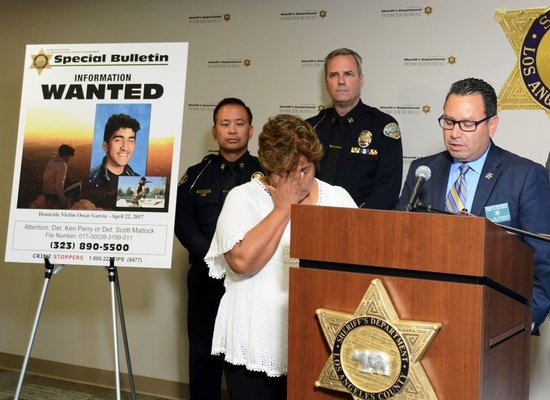 Photo top, Guadalupe Castañeda listens as Los Angeles County Sheriff's Lt. Joe Mendoza describes the man who shot and killed her son, Oscar Garcia, in a Monrovia garage on April 22. Below, a sketch of the light-skinned Latino accused of shooting Garcia. Photos provided by Los Angeles County Sheriff's Department. — Irving April 25, 2017 at 4:04 p.m.